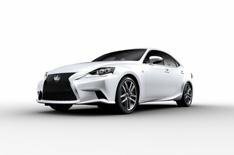 Lexus IS pricing revealed | What Car? Prices and specifications for the Lexus IS range have been unveiled ahead of its UK launch this summer. The new ISs bold design, featuring more aggressive styling and the car maker's signature grille, was revealed at the 2012 Detroit motor show. The IS250 gets a 2.5-litre V6 petrol engine mated to a six-speed automatic gearbox, while the IS300h hybrid is powered by a 2.5-litre petrol engine and an electric motor with a combined power output of 217bhp. It's expected to offer average economy of 65mpg and sub-100g/km CO2 emissions. All IS models get cruise control, climate control, digital radio, Bluetooth, keyless entry and alloy wheels. Four trims are available: SE, Luxury, F Sport and Premier. Top-of-the-range Premier models get leather seats, sat-nav, rear-view camera and a Mark Levinson sound system. The IS250 starts at 26,495 for the SE model and goes up to 35,495 for the range-topping Premier. IS300h models range from 29,495 to 38,495. UK deliveries will start in mid-July and order books are open now.